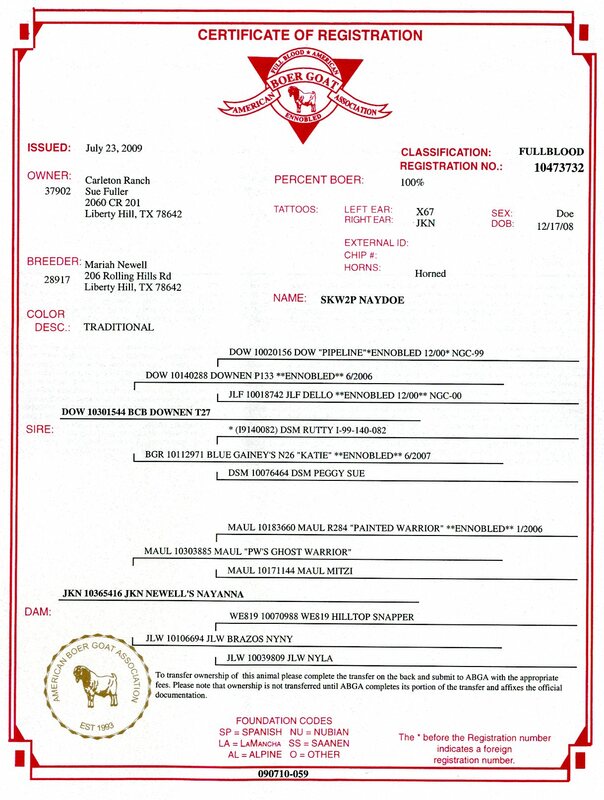 This page shows a selection of our fullblood and purebred registered does. 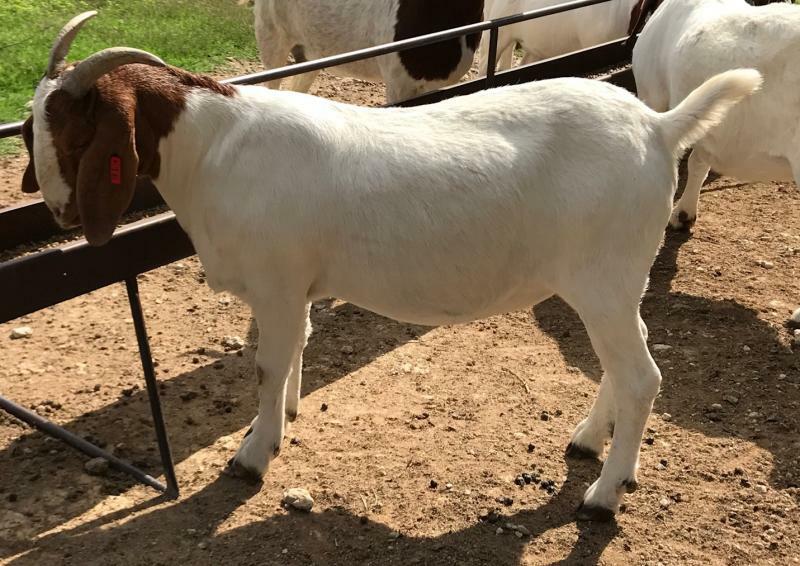 Here is EVEN My Valentine Kisses are Sweet, purchased from Julie Stevens at the Texas Traditions Sale in Oct. 2017. This is her pedigree. 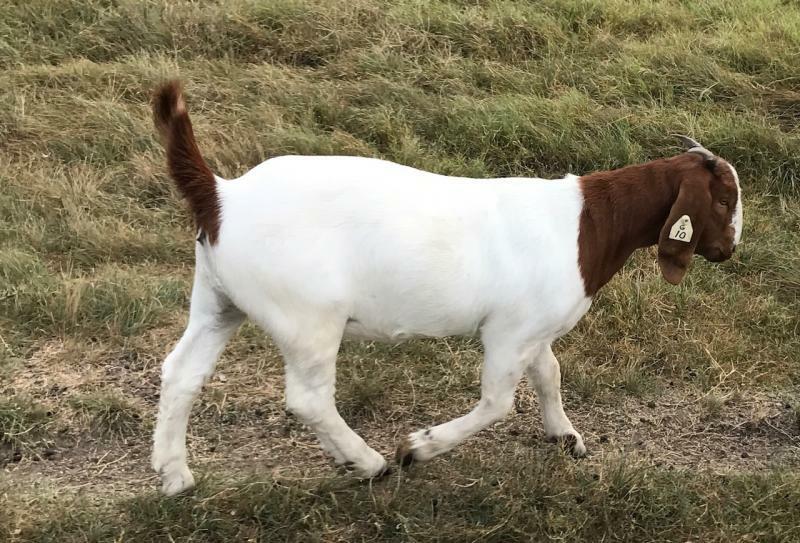 This is Rocky Acre Janie's Got a Gun, from Rocky Acre Boer Goats. Here is her pedigree. 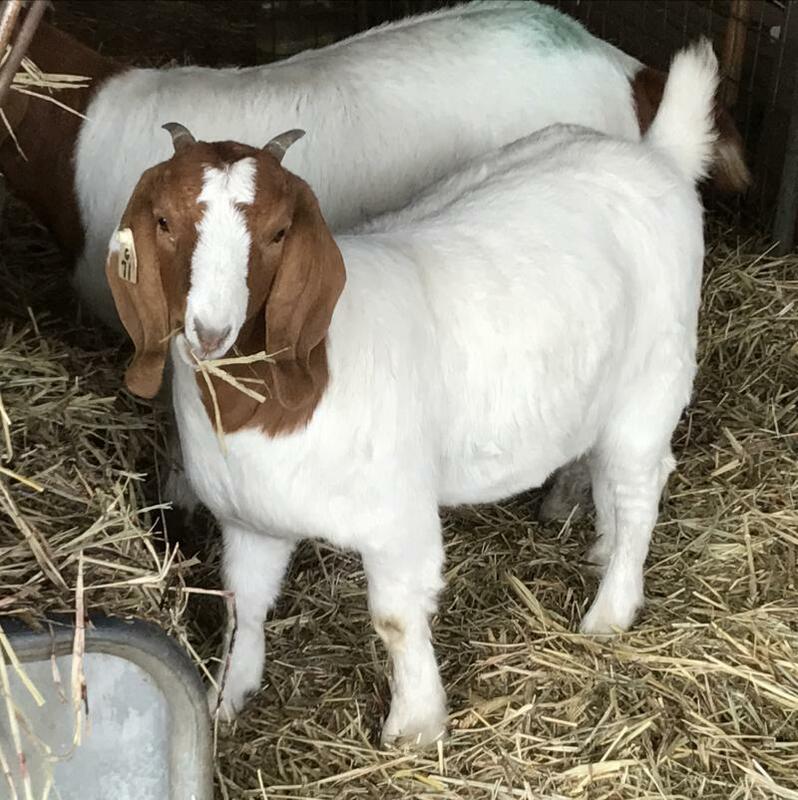 Next are 3 fullbloods from Blue Top Farm, all daughters or granddaughters of BBO Booty. Kilo and Kaci are also granddaughters of CONI War Eagle. 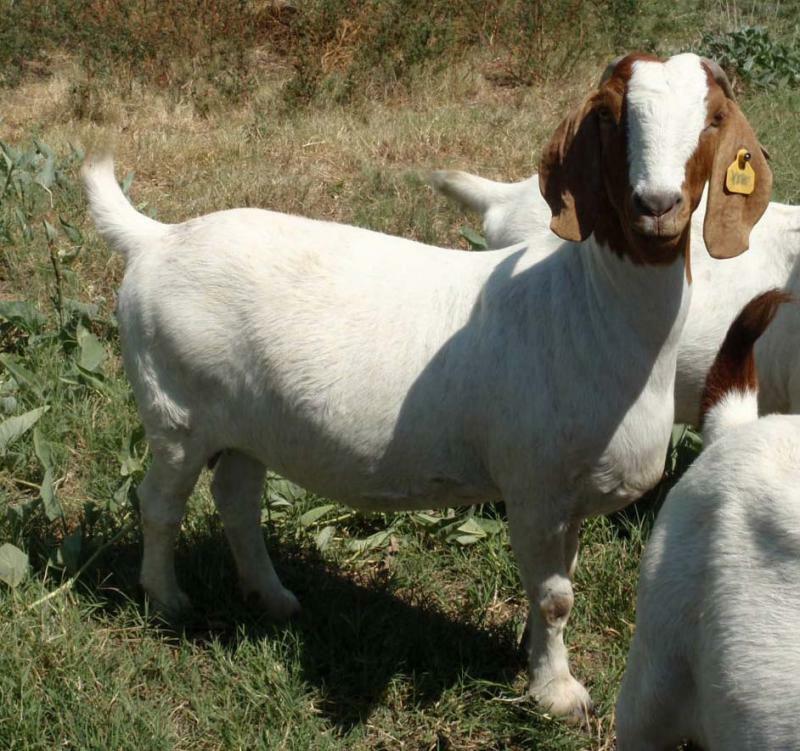 This is RDSG Rockin' Hot Honey, from RDS Goats in Clovis, NM . She is the dam of Bond Girl, pictured above. Here is Honey's pedigree. 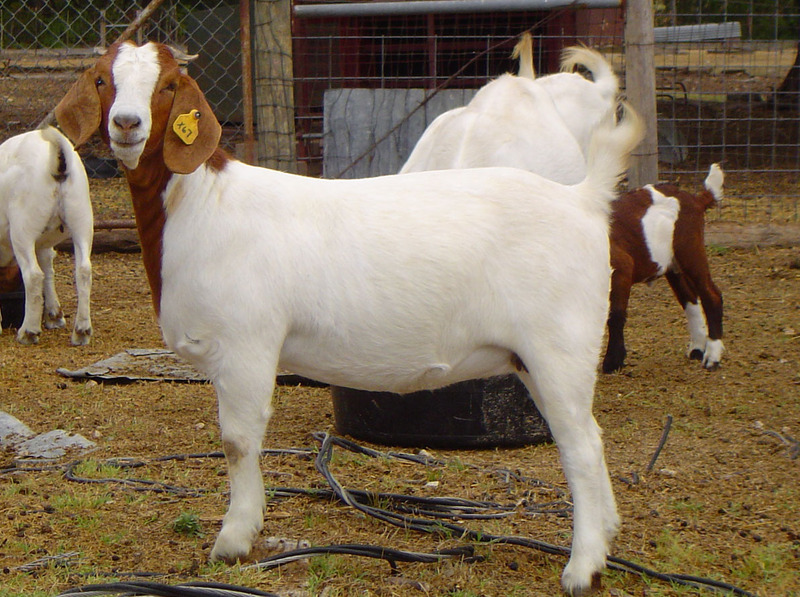 This is GLB Flashy, who combines Fix it In A Flash on her sire's side with Pistolero on her dam's. Here is her pedigree. 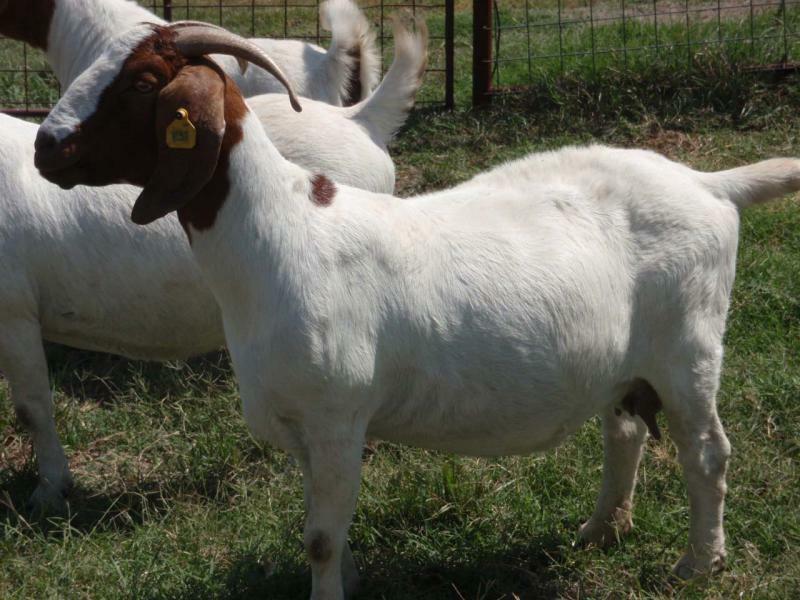 The next 3 are fullblood does we bred ourselves, all 2014 models. First is SKW2P Warrior's Sugarbritches. She is a Jangles Reloaded daughter, out of NewTron Star. 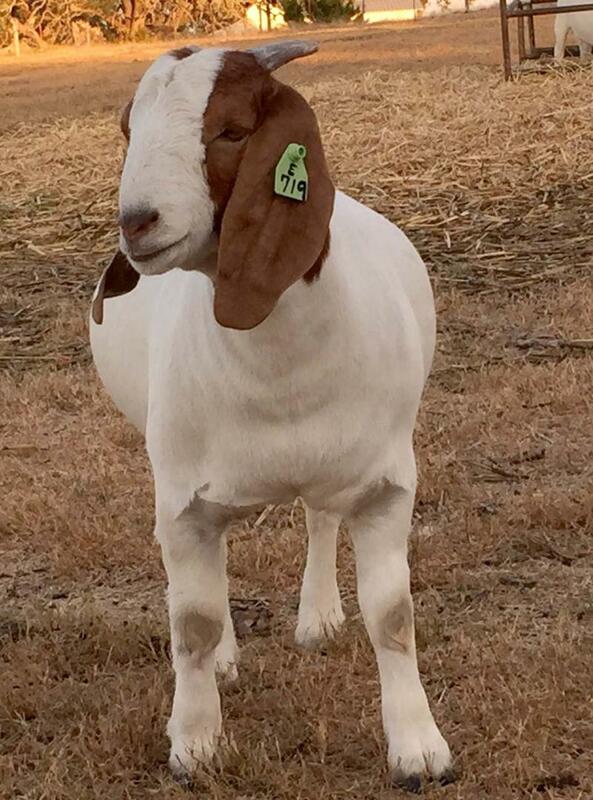 She is 4 months old in this photo, and was bottle-raised, as her dam died after kidding. She is spoiled rotten! Below is SKW2P AK-47's Hot Lips. She is a Spitfire daughter, out of SKW2P Kiss Me Quick (Big Lips x Fully Loaded). She is 9 months old in this photo. Third is SKW2P AK-47's Chick on a Spit. 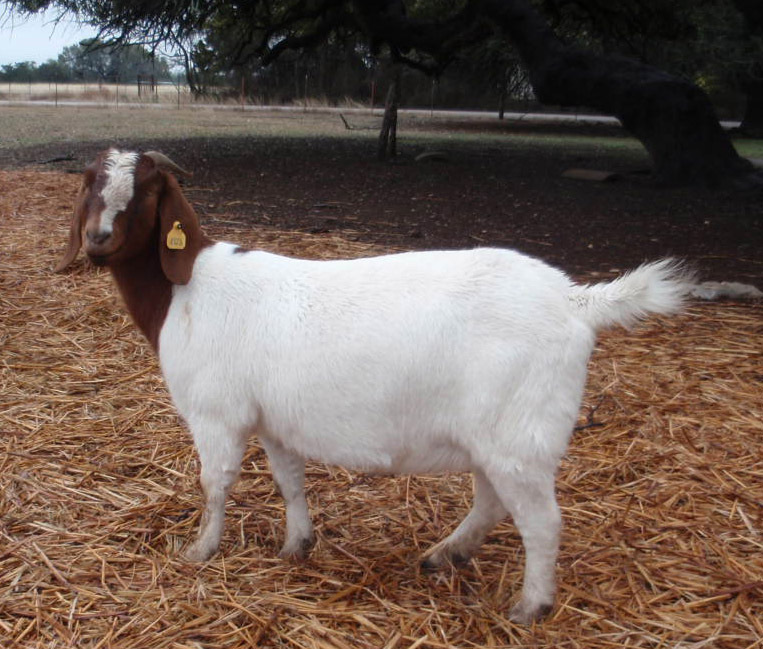 She is a Spitfire daughter out of Hibbs Alice in Chains (a Chicken on a Chain daughter). She is 9 months old in the photo. Alice is pictured in the section of does we no longer own at the bottom of this page. Does that have died or been sold. 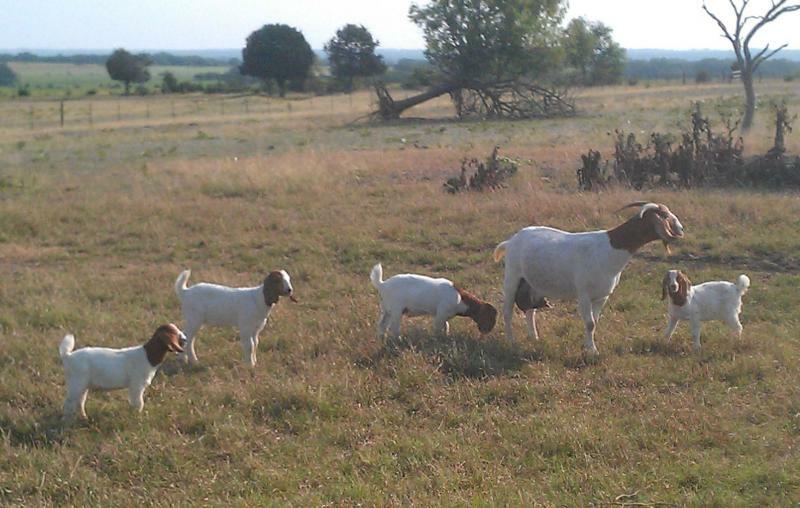 We include these reference photos, as many of these girls we formerly owned have offspring still in our herd. 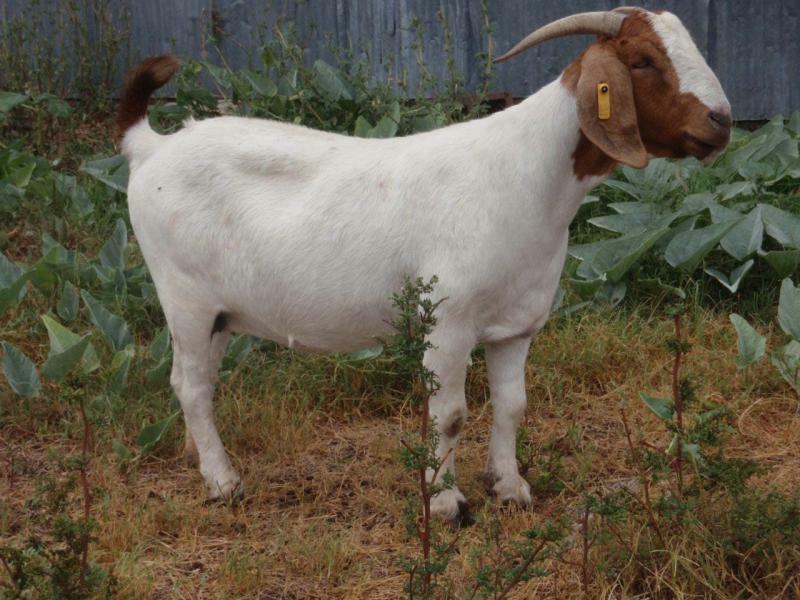 This is OWE Coni's Flash, a Purebred doe from Owens Boer Goats. Here is her pedigree. And here is OWE Cally,a fullblood doe also from Owens. Here is her ﻿pedigree. Here is a Chicken on a Chain daughter from Cossatot Boers in DeQueen, Arkansas. She is HIBB Alice in Chains, 6 months old in this photo. Here is her pedigree. 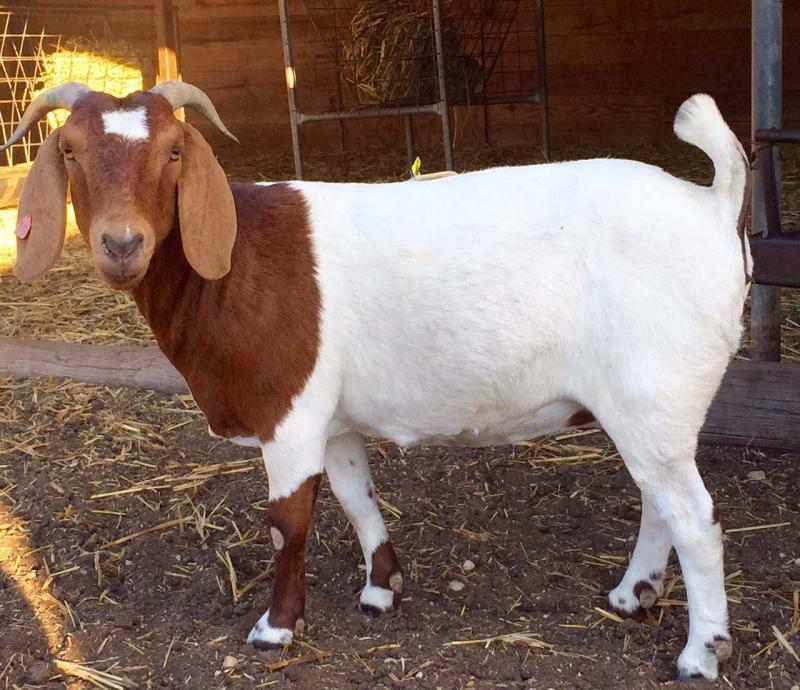 Alice died of a torn uterus while kidding in May 2017. 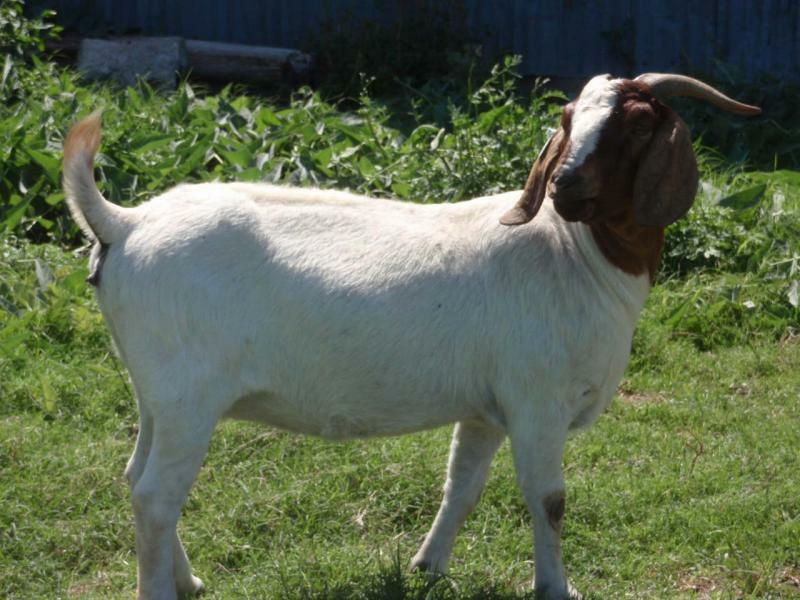 Here are more 2012 acquisitions, from the Newell Ranch dispersal sale. 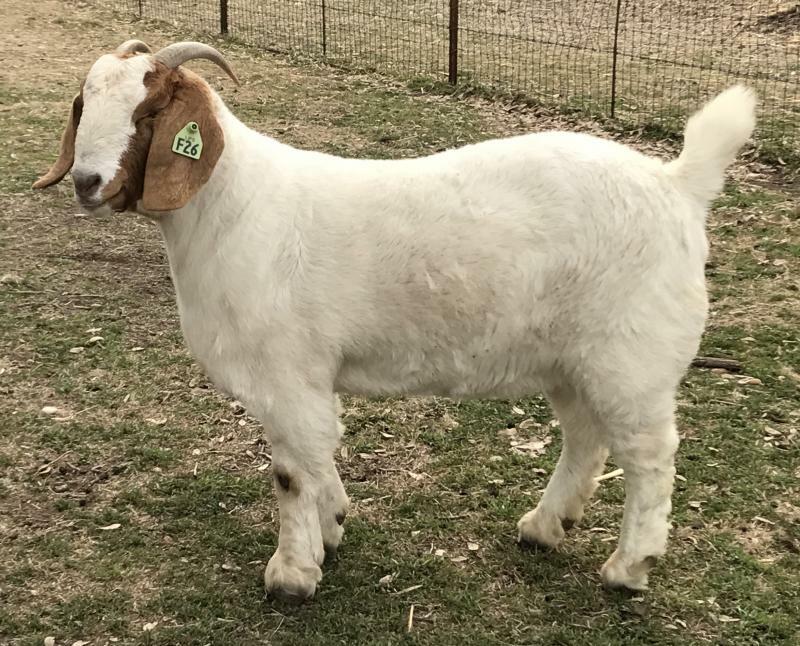 These mature does bring us some great genetics, including DOW Pipeline, CONI Warrior, Blue Gainey's Katie, FSE Dude and a bunch of EGGS lines. 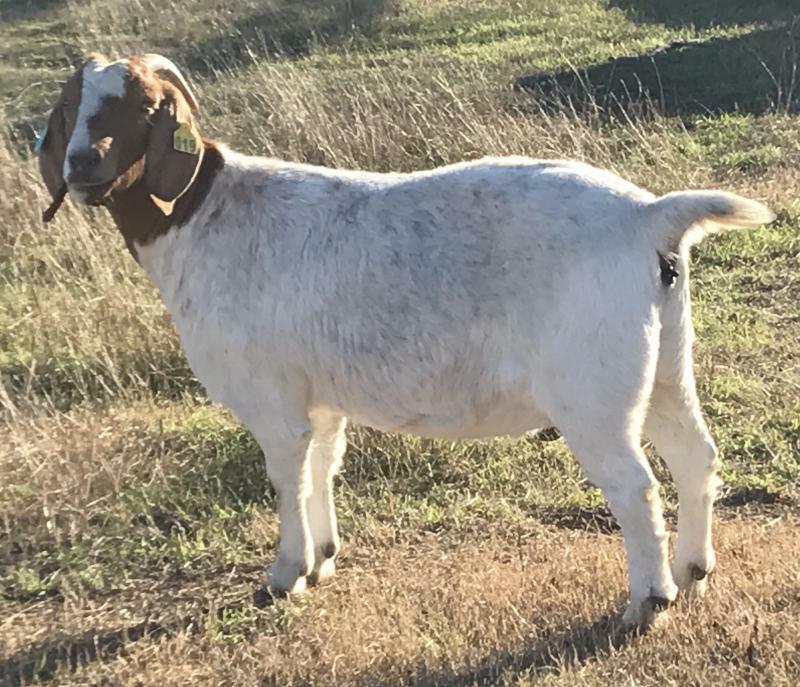 Also known as Alpo, due to her fondness for dog food, she now belongs to Rafter W Boer Goats in Cleburne, Texas. 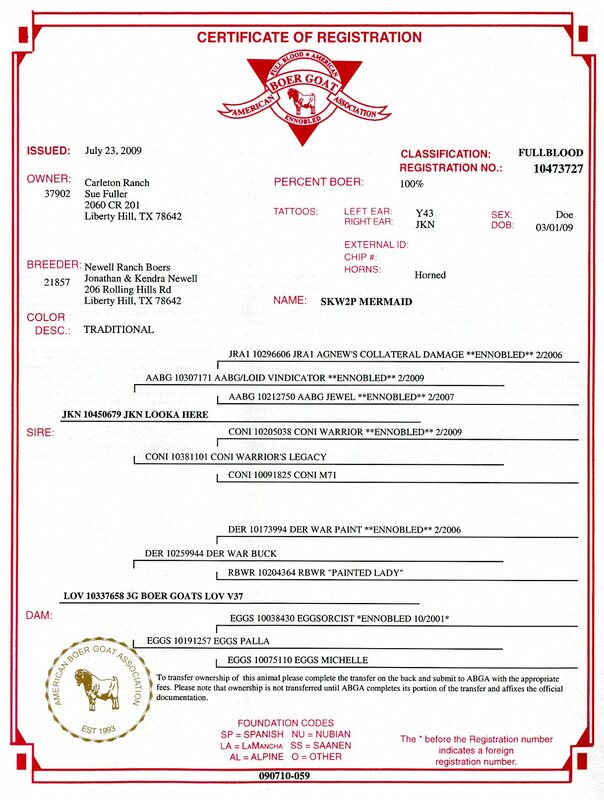 Below is CONI Z1266, a double-bred CONI Warrior grand-daughter. This is her pedigree. 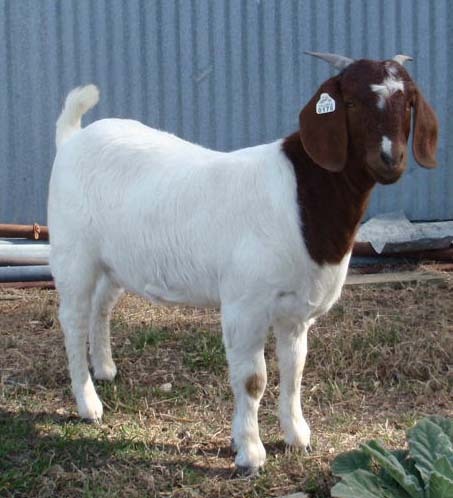 Below is SKW2P Naydoe, born Dec. 17, 2008. 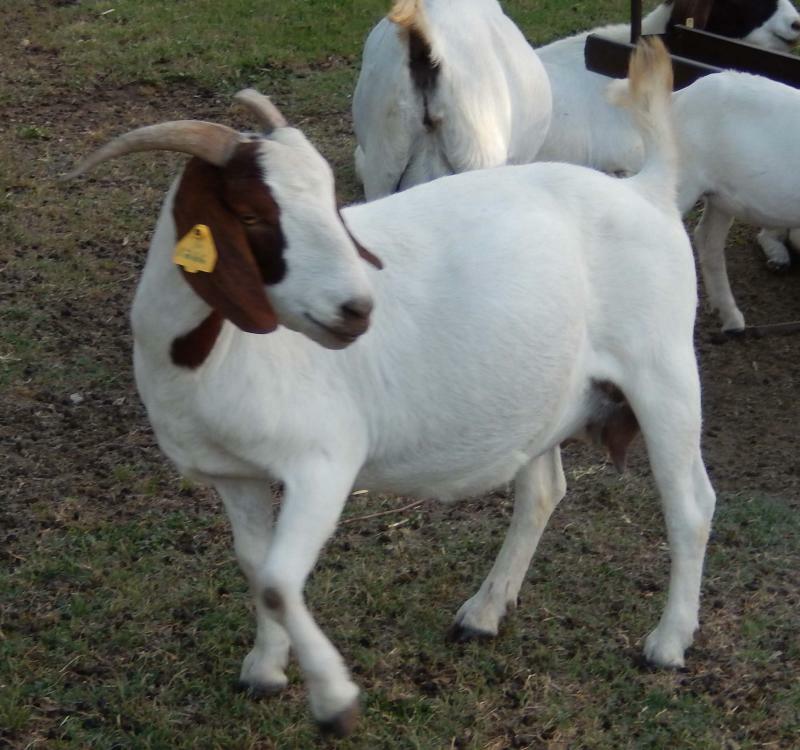 Below is SKW2P Ari's Girl, born Dec. 14, 2008. She is a half sister on her sire's side to Naydoe, above. 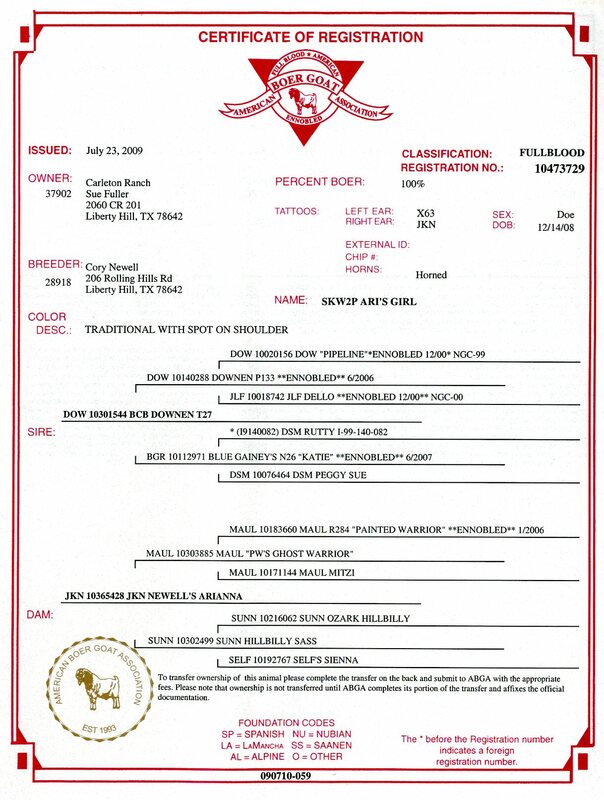 Below is SKW2P Mermaid, born March 1, 2009. She kidded quadruplets by Tornado in April 2012, and raised all 4 of them on her own. This is Hayr W1, born April 29, 2007. 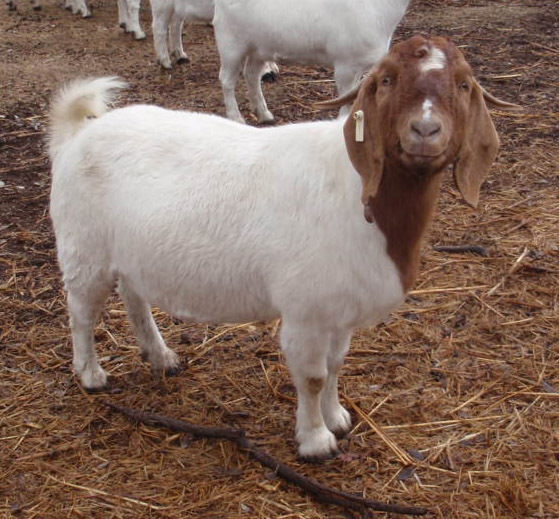 She kidded a single gorgeous doeling by KTM Fully Loaded in March 2012. Her doeling placed 2nd of 12 in her first ABGA show against some very impressive competition at 11 weeks old! 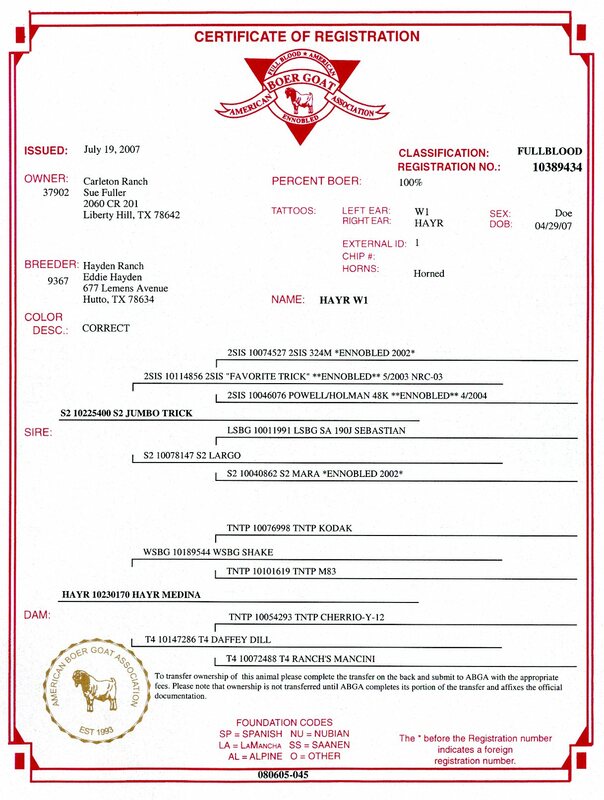 Link to Hayr W1's pedigree.